"...Throughout the show's 2 hours and 40 minutes (as against the 75-minute movie), there will be plenty of instances of breathtaking beauty and scenic ingenuity, realized through techniques ranging from shadow puppetry to Bunraku. Certainly, nowhere before on Broadway has a stampede of wildebeests or a herd of veldt-skimming gazelles been rendered with such eye-popping conviction. But in many ways, Ms. Taymor's vision, which is largely rooted in ritual forms of theater from Asia and Africa, collides with that of Disney, where visual spectacle is harnessed in the service of heartwarming storytelling. There will inevitably be longueurs for both adults and children who attend this show. But it offers a refreshing and more sophisticated alternative to the standard panoply of special effects that dominate most tourist-oriented shows today. Seen purely as a visual tapestry, there is simply nothing else like it." "Make no mistake: The Lion King is a rare theater experience. The musical is intelligent spectacle, extravagance with a purpose -- and a heart. From the moment it begins, The Lion King offers astonishing stage magic. Performers walking on giant stilts become giraffes, birds, and a pride of lionesses, dance with a solemn gracefulness that is breathtaking." "You will be bombarded by some of the most beautiful and spectacular sights theater can offer from before and behind, so eyes in the back of the head will come in handy. "...A new generation of cats just took over Broadway. Simply said, Julie Taymor's staging of Disney's "The Lion King" is a marvel, a theatrical achievement unrivaled in its beauty, brains and ingenuity. Leaping far beyond its celluloid inspiration, the stage version improves upon nearly every aspect of the hit 1994 animated film, from visual artistry and storytelling to Lebo M's score and the newly African-ized pop songs of Elton John and Tim Rice. With this production, the Walt Disney Co. stages itself as a serious and ambitious contender on the legit scene, all but demanding that its first theatrical foray, 1994's too-literally adapted "Beauty and the Beast," was little more than a warm-up." "From the very first minutes of The Lion King, you feel yourself on new ground -- no, in a whole new world....When The Lion King is good, it's enthralling." "...Yes, The Lion King's pacing drags a bit in the first act, and the show's venue, Disney's opulently refurbished New Amsterdam Theatre on 42nd Street, has a few kinks (you'll miss a lot of the show if you're seated too far to the side). But Taymor's amazing vision overrides any quibbles. 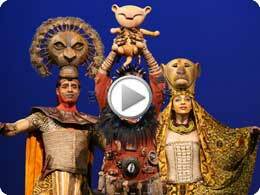 The Lion King can make you fall in love with theater no matter what theater it's in." "...A jaw-dropping magnificent spectacle. The show and the playhouse are enchanting. The unprecedented production is worth every penny. If this is Disney's idea of a theme park, we are delighted to report that the theme is quality." "Taymor populates the stage with an amazing menagerie of beasts; her audacious staging expands a simple cub into the pride of Broadway, not merely a fable of heredity but a celebration of heritage." "...Come to The Lion King with two pairs of eyes, one ear, and half a brain. You will be bombarded by some of the most beautiful and spectacular sights theater can offer from before and behind, so eyes in the back of the head will come in handy. You will be harangued by second-rate standard-show music and lyrics by Elton John and Tim Rice, and also by Lebo M�'s stirring African chants and ululations, to which your active ear should be cocked. Finally, you will be subjected to a well-worn, simplistic children's tale about a lion cub's hard road to adulthood and the throne of the animal kingdom, usurped by his wicked uncle in cahoots with some murderously laughing hyenas." "...Awe-inspiring! Broadway theater is alive again. [Julie] Taymor's imaginative ideas seem limitless. it's a gorgeous, gasp-inducing spectacle. Most important - against all odds - it has innocence. The show appeals to our primal, childlike excitement in the power of theater to make us see things afresh." "...In the opening moments of "The Lion King," director and visual poet Julie Taymor exploits these Tim Rice lyrics so gorgeously that you may feel your head will explode from too much sensory pleasure...And yet it's jolting to be reminded of a plebeian sensibility after rapture. In fact, this Disney production insists on having it both ways--the poetic integrity and the pandering too." "...I'd say run don't walk to get your tickets, but there's really no need to rush. I'm not a gambler, but I feel safe in predicting that this spectacular translation from canned entertainment to vibrantly alive stage show is more than likely to become a Forty-Second Street landmark. In fact, if thirteen-year-old Scott Irby-Ranniar, the delightful young lion hero doesn't tire of show business, he might well get a chance to graduate to the role of the older Simba. So what makes the multi-talented (director, puppet/mask and costume designer, music/lyric contributor) Julie Taymor's version of The Lion King so special?" "...The question is: is it good? Well, most of the time it's visually impressive, and a good deal of the time it's reassuringly familiar...But, for me anyway, nice as it all is, there's a notable lack of energy here. The material is notably weak--the storyline is simple-minded, the book is clumsy, and the score is only average--and even dressed up with all the avant-garde pizazz and theatrical technique that costumer-director Taymor can muster, this fundamental weakness can't be overcome. Without a compelling story to tell, the show finally is only about telling a story." "Watching the faces of all the actors as they dance and sing with their puppet counterpoints make this show an enchanting evening of enjoyment for just about any age audience." "A stunning stage event. Combining a graceful horde of actors, singers and dancers with a stylized world of fantastic puppets and theatrical wonderment." "So come find out what all the fuss is about, and re-introduce the kids to all their favorite characters -- Simba, Nala, Mufasa, Zazu and of course, Timon and Pumbaa -- in a vibrant, colorful and magical new way." "The show is a visual masterpiece...The characters are as lovable and enduring as in the film." 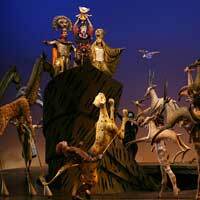 "If you liked the film of "The Lion King," you will not be disappointed by the Broadway musical. And if you have not been a Disney fan you will be knocked out by this transformation of an animated film to a live theater piece." "Disney delivers razzle dazzle, plus pomp and pageantry..."The Lion King" needs it. The coming-of-age story is about as fresh as yesterday's bread and as tiny as one of those sidekicks in Disney's animated film." "A powerful multicultural cast that steals your breath and makes you feel your heart will burst with pleasure.Taymor's use of elegantly ingenious puppetry obliterates the realistic theater as we know it and takes us to exotic new places. Every performance is a standout." ""The Lion King,'' with its life-sized puppets, tribal drums and revolving scenery, is not a product of re-creation but one of creation...Julie Taymor has kept the basic plot of the 1994 cartoon movie while expanding it into a purely theatrical form all its own." "The dramatically imaginative "The Lion King" is perhaps the most visually amazing production ever seen on stage...Heart-grabbing and jaw-dropping, "The Lion King" inspires awe from its opening moment." "The opening number alone is enough to send you leaping from your seat. With bursting sunrises, a stampede, and comical interactions among the diverse characters...The Lion King offers enough eye candy to satisfy audiences inured to lavishness by rising helicopters and crashing chendeliers." "It is a wonderfully colorful spectacle with some of the most imaginative staging you are ever likely to see." "To see "The Lion King," winner of the 1998 Tony Award for Best Musical, is not only to witness a groundbreaking combination of music, scenery and puppeteering, but also to be made aware that every living being, from the largest elephant to the smallest bird, is connected in some way." "The Lion King musical is a great starter drug to the theatre world as the familiarity can give you a very enjoyable night out. If you are a Disney fan or theatre fan it is hard not to recommend going to see the show. If you don�t like theatre � why not give it a try." "One comes away with a sense of having witnessed a dazzling kaleidoscope of perfection, both in performance and in spectacle, yet with the profound satisfaction of experiencing something beyond theatre. To say the effect is breathtaking is an understatement, it is overwhelming." "Taymor's creation is a breathtaking visual and aural feast that begins with a thrilling opening scene so euphoric the rest of the show is almost anticlimactic. The animal kingdom has never been so spectacularly re-created on a stage." "A bold work of art, and stylistically the most daring piece of theater, to hit mainstream musicals in years. You gotta love it - and judging by the roars at a preview performance for critics and insiders last week, Broadway does. "The Lion King" - arguably the most expensive puppet show in history - is a long, imperfect musical. But it is also a dazzling, one-of-a-kind entertainment." "Breathtaking moments abound: The wildebeests stampede directly toward the audience, growing ever bigger; fish and eels swim through a river; the heat of an African drought evaporates a shrinking lake; and the second act opens with multicolored birds flying above and through the theater." "The Lion King is a spectacular rendition of the animated film, a brilliant theatrical adaptation that stands on its own...Taymor has risen to the challenge, translating the physically complex tale to the stage with an endlessly clever, visually stunning use of masks, puppetry, costumes and scenic effects; the stage show has the delighted audience firmly in its grip."